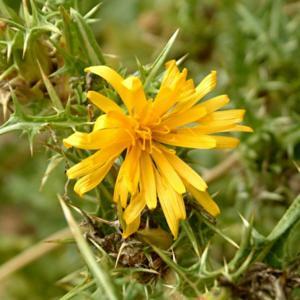 Prickly biennial or perennial with sturdy erect and branching stem, with a milky sap. Forms a stout fleshy taproot. Alternate, stiff, leathery, pinnate leaves, the lobes making large spines. They are dark green with clear pale green viens and markings. Bright golden yellow flowers in summer. Well drained, particularly sandy or rocky soil in sun. Tolerant of various conditions, poor soils and drought. The root is edible as a cooked vegetable and is similar to scorzonera, with a sweet flavour. The flowers are sometimes used as a food colouring. Wildflower of the western Mediterranean area, occationally naturalised elsewhere.